While trying to think of new ways to introduce quilling to all ages at a craft demonstration, I had the idea of rolling and stacking discs to make necklace pendants... it would be easy to do and by using a wide variety of colorful paper strips, I hoped they would appeal to children and adults alike. I'm picturing young girls making them at a crafty-themed birthday party or as holiday presents for their friends. They could also be a mother-daughter project some weekend afternoon. For the trio above I used metallic quilling paper in jewel tones which really dresses them up. A variety of pendant shapes can be clustered on a necklace or dangled from a backpack keychain. They'd even work well as miniature tree ornaments. This colors of this one make me think of summer and striped buoys at boating events that mark the race lines. A complete tutorial can be found at Craftzine. Happy Halloween! Here's a little something appropriate for the occasion - and I do mean teeny-tiny. Erica of Elated Life saw the post about paper eyelashes a while ago and decided to try making some with her die cutter to wear as part of her costume. It worked perfectly - here she is modeling the starry-eyed results - cute! wonderful shiny pendants and cutie eyelashes!!! Such cute pendants! I love the metallic paper for them, it really makes them shine! Thanks also for the mention and link to my post. I'm glad you liked the results! gorgeous pendants, love the metalic paper, and the lashes are cute!!! Oh thank you for the links. These are really very pretty and the blue one did indeed remind me of a buoy. I can see these as tree ornaments on my little Norfolk Island Pine at my desk at work. Hi Ann!!! Love this idea!!! As you said it´s perfect for classes but also looks great as a pendant. The paper and the colors are amazing!! I am totally in love with these pendants. I really like your quilled stacked pennant necklace. Although I admit I clicked on it first because it looked like a dreidel. How do you make paper eyelashes?? These pendants are so very lovely Ann. Thanks for your complete tutorial. Each time I find something so clever about the way you work. The tip about the glue is very useful. I love the simple elegance of the pendants! The metallic papers are the perfect choice to show off the paper and the design! The rolled pendant is really a nice project to do with my daughter. I showed it to her and we're going to attempt it this week! With any luck I can send you photos of the finished product. Thanks everyone! Katie, I bet they would make good dreidels - I'll have to experiment with shaping the rolls into squares. 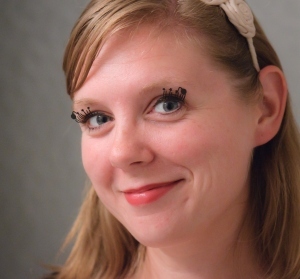 For info about Erica's eyelashes, click on the link to her blog post. Congratulations beautiful pendants and beautiful colors, I love it! Ooh, the pendants are such a great idea! Simple to make, yet they look so great! Ann, love the pendants, metallic colours look fabulous together...I love paper beads/jewellery!! Your tutorial on Craftzine is very clear and great pics.